In a warehouse far, far away, the galaxy’s top Star Wars collector holds court #SciFiSunday « Adafruit Industries – Makers, hackers, artists, designers and engineers! Take a look at some of the top collectors of Star Wars memorabilia, from TheGuardian. 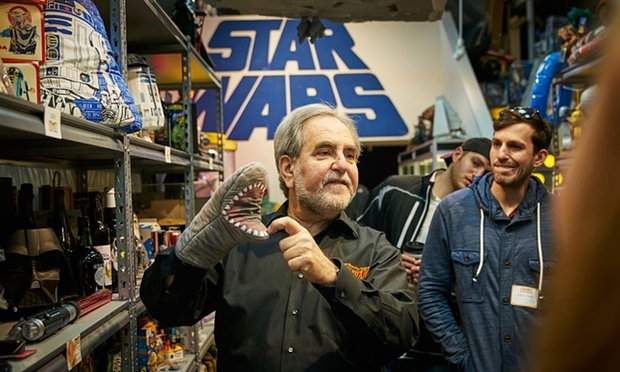 Standing inside his back yard chicken coop-turned memorabilia museum, Steve Sansweet cues up perhaps the most recognizable movie score in history: a full-throated orchestral rendition that conjures up images of space battles in a galaxy far, far away. Then, with a dramatic flourish, he opens a door on to a vault the size of a Toys R Us sales floor, with shelf upon shelf of one man’s obsessive personal grail: the collection of the world’s most voracious Star Wars collector. “Ohhhhhhhhhhh!” the group gasps in unison. A 70-year-old former newspaper reporter, he steps back to steep in the reaction of 16 fans on a guided tour of his museum that includes several life-sized Darth Vaders, Princess Leia statues, shaggy Chewbacca heads and R2-D2 robots. There are also goofy games, stuffed dolls, action figures, pre-production prototypes and shameless knockoffs of the wildly popular sci-fi adventure films. Star Wars: The Force Awakens, the seventh installment in the Hollywood franchise, opened in December, threatening to knock the globe off its axis; the blockbuster broke the billion-dollar mark within 12 days, a record. One comedian termed the opening the biggest sequel since the New Testament.